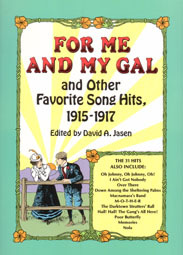 Original Sheet Music with lyrics for 31 hits songs of 1915 through 1917. Also included is a list of the songwriters and lyricists with dates and brief description of their body of work. Works by George M. Cohan, Jerome Kern, Irving Berlin are included along with songs from Broadway and tunes from Tin Pan Allen. PUBLIC DOMAIN STATUS: The publisher states: "All the selections in this volume are in the Public Domain in the United States. They may be used in these original versions or adapted or modified and used for any purpose, private, public, educational, or commercial. No permission, fee, or royalty payment is required. The above does not apply in countries outside of the United States where copyright protection may exist.